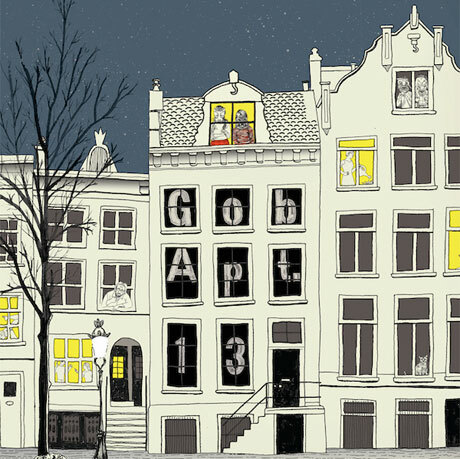 The Canadian alternative rockers in Gob are back with their newest album, APT 13, their first release in seven years. Check out my interview with vocalist and guitarist Tom Thacker below as we discuss the western Canadian punk scene, the new album, and more. The Daily Slice: First off, for anyone who isn’t familiar with Gob, can you introduce yourself with your name, what you do in the band, and your favorite pizza topping? Tom Thacker: My name is Tom Thacker, I sing, play guitar and write songs in the band Gob. My favorite pizza topping is Kalamata olives. Any pizza joint that has them is pretty serious. TDS: How does Gob fit in to the Canadian punk/pop-punk scene? Has your “place” in the scene changed over the past 11 years? TT: There’s a pretty rich punk rock history on the west coast; DOA, No Means No, Subhumans, SNFU, Dayglo Abortions, to name a few. But we weren’t really in a scene with those bands, they came before us. Back when we started our band we were considered the shithead kids of the scene, now 20 years later we are sort of considered the elder statesmen for Canadian pop punk. A metamorphosis, if you will. TDS: Considering APT 13 is the first album that Gob has released in seven years, what made you and the rest of the band decide that now is the time to put out new music? TT: We actually started recording Apt 13 in 2011, the songs were all written in 2010. It just took a while to finish the record since 2 of us live in Vancouver and 2 of us live in New York now. We actually hoped to put the record out in 2011! Released through New Damage Records, APT 13 is available to stream via New Noise Magazine and Exclaim. The album is also available for purchase on iTunes and Amazon. TDS: What were the biggest setbacks in this recording process and how did you guys overcome them? TT: There were a ton of setbacks, everything from relationships ending, losing loved ones, moving cross country. I was also busy touring with Sum41 a lot through 2010-2013 so that got in the way as well. TDS: How much of the album changed from the beginning to end of your writing and recording process, since it took a few years to complete? TDS: I know you’ve said that old-time Gob fans would be excited about the new album because it still has that classic Gob style and sound. Since the band is 11 years older now than when you started, there must be some differences that show through the music. How do you find a balance between the old and new? TT: Now that some years have gone by I think it’s easier to see what’s good about our early records. Back then it was more apparent what we needed to improve about our music. We try not to over think things, we just want to keep every new record fresh for ourselves and for our fans. TDS: How has the response to the album been so far? Have you received any reactions that surprised you in any way? TT: The response to Apt 13 seems to be great. The most surprising reaction was when an interviewer asked if I took singing lessons, he said that I sound like a proper singer now. Fair enough I guess, I used to basically bark into a microphone. TDS: What plans do you have with Gob as of now to follow up this album? Any music videos in the works? Tours? Festivals? TT: We’re shooting a video for Radio Hell very soon! We’re touring across Canada in Oct-Nov and we played a bunch of festivals this summer. We plan to spend the majority of 2015 on the road. TDS: I started with a pizza-themed question, so of course I have to end with a pizza-themed question. In your years of traveling the world as a musician, can you think of one particular place that had especially awesome pizza? TT: Pizza is pretty awesome anytime and anywhere but I think NYC has the best pizza so I’ll recommend a couple of my favorite spots for those traveling to NYC or if you’re new to the place. First, I would recommend Pala in the Lower East Side, it isn’t a traditional pizza place but they make amazing vegan pizza so VEGANS TAKE NOTE!! I would also recommend, if you’re in my neighborhood, in the Upper East Side get some no-nonsense great pizza at Roma’s.